Back in the kitchen he fished in his various pockets for a dime, and, with it, started up the coffeepot. Sniffing the — to him — very unusual smell, he again consulted his watch, saw that fifteen minutes had passed; he therefore vigorously strode to the apt door, turned the knob and pulled on the release bolt. ‘You discover I’m right,’ the door said. It sounded smug. ‘I’ll sue you,’ the door said as the first screw fell out. One of the fun things about studying things historically is to realise how modernity is laced with the past — intersected, habited, haunted. Not in the sense of plus ça change, more in the sense that the “new” carries with it undertones of leads already explored, of thoughts already spoken, of directions already tried — in a quasi-biological sense. The now, in science-fiction terms, is merely one of the possible futures that the past has developed — but it bears the traces of what might have been — tantalising, inviting us to invent tomorrow. So we now call it “viral marketing”, or even “prankvertisement”, but it is ballyhoo back from the 1920s, promotional stunts that are meant to get people to talk about the film, at all possible cost. And just like ballyhoo, it is, at the very least, about rehearsing audiences’ media competencies — working on that border between the fake and the real, helping them (us) put reality in play. This training of media competencies, then, goes back a long way — the “magic” of new media technologies more a skill we entertain than an innate quality of any medium. Viral marketing, then, takes the Barnum hoax (Barnums’ “operational aesthetics”) to new, more modern, heights: “is it fake, or is it real?” It is the same question, it is the same game — but realising that we’ve been playing this game for at least 200 years (much, much longer than that: since the first time a human decided to make-believe that any piece of unbelievable information relayed in some form, oral, painted, etc., was potentially true) may help us enjoy it more — indeed, help us live with media fictions. the way the movie restricted all economic activity on Earth to Matt Damon’s character’s factory job or his sweetheart’s nursing job (an economy based on just those types of low-skilled jobs would very soon crumble: what of the research, innovation, engineering jobs? How do these professionals feel about inequalities? About Elysium? How do they vote? These are all world-building questions, and what good sci-fi should be about as it attempts to build a model of a possible future). Indeed, it may be because that world-building was going on somewhere else: on the official website for the movie (www.itsbetterupthere.com), where there is[still, as of 24 Jan. 2014, but for how long?] a rich array of websites pretending to be from the construction company of the space station, complete with set-drawings blueprints of the homes one may “buy” on Torus. In lots of ways, the world-building that goes on with the promotional websites is more interesting than the movie itself — conventional, déjà-vu plot-driven fast-paced flick. And this raises the question, at least to me, of whether the film is not suffering from the fact that a decision was made to outsource lots of world-building material to the promotional campaign. 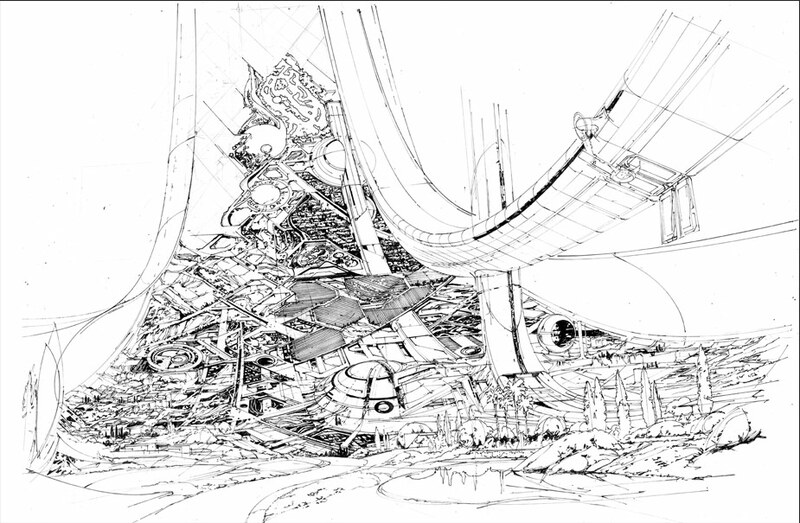 Think about all the detailed world-building that went into the film itself of 2001, and made the experience of watching the film truly mesmerising. You’d have to start toying with the Elysium website before you’d start feeling the same level of amused amazement, the desire to stay in that world. Incidentally, if the marketing is part of the fun of the film, it also raises the question of what happens to the film once that promotional material is gone (the anti-segregation blog “set up” by alien Christopher Johnson, a promotional stunt devised for District 9, for instance, has been archived, but the official link is dead) — and whether a true artist of viral marketing should not expand efforts into maintaining the fictional worlds they have set up for the film. Whether or not this would make any business sense, for the artist, would hopefully be irrelevant, though this points to a potential site of tensions here: the long-lasting relevance of a work, or the short-term, but powerful, vibration of meaning of a work encountering an audience? What if the second burst, though ephemeral by definition, could be made to last? A film like 2001 has no problem recreating its own flash of relevancy for a modern audience–but couldn’t there be another path to artistic longevity that promotional stunts, allied with new media tools, fast-speed networks, virtual reality equipment, and so on, could trace in the future of the industry? Prometheus may have been a disappointing film (haven’t seen it), but the website still looks good, inviting, tantalising — magic of sort, yes. All of which makes me wonder if there is not more creativity being now expanded into the promotion — and less into the films themselves — and if the true evolution of transmedia storytelling is not just that the film fictions expand into other media, or that the films serve merely as events to launch a new line of merchandising, toys, TV series, and other products, as we are all quite aware — but that, more profoundly, the films serve as launching pads for the true fictional life of the stories that indeed take place somewhere else, in the promotional stunts. That the film becomes, in other words, a fictional virtual space more than a text. That maybe we need to think about a future where the film is reduced to a clickable link (“You Don’t So Much Watch it As Download It”) on a website where lots of other material build a detailed and amazing fictional world — where the film is one possible activation of the fictional world, which remains however open to other narrative possibilities through the world-building the websites offer. Given that promotional budgets may come to dwarf production budgets, this would not be such a surprising evolution after all–an evolution where film, “cinema” as we used to call it, expands its “interface” from a screen (a movie screen at first, a TV screen next, a mobile screen now) to a space (cyberspace, virtual reality). The research project: to trace the development, history, genealogy, variations, evolutions of ballyhoo, promotional stunts, prankvertisement as the interface of cinema — from 1920s carnival to Torus, as cinema’s privileged world-building tool, en route to our future(s) where living with virtual realities is going to be loads of fun. and what’s more it’s still as controversial as ever. It starts somewhere, it doesn’t matter where, as long as it starts. In this case it starts here, a brief post from the Le Monde-hosted blog Playtime, which describes the first games created by a machine along a set of rules of game grammar as explained in this pdf doc from Michael Cook, a PhD student in computer science at Imperial College London (the English-version and original publication about Angelina is here, from The New Scientist) — and by the way the whole area, new to me, of “procedural content generation”, which seems to be already a reality of game designing, though in isolated functions of games, ought to be something I look into in the near future, not just because of the promise of its use for an entire game design, as Cook and his colleagues at Imperial College point out, but also for movie production. I wonder how long it’s going to take before we have films with AI-generated plots (and I mean more than movies as computing code, though that’s a (funny) start) ? Anyhow, to go back to the point, today that’s where it started. Down that Le Monde post, the game Façade, a 2005 self-described “one-act interactive drama”, gets mentioned. Not just another video-game, me-thinks, but “interactive drama” — gentlemen, the holodeck has arrived ! The dream of interactive drama, perhaps best envisioned by the Star Trek Holodeck, has players interacting with compelling, psychologically complex characters, and through these interactions having a real influence on a dynamically evolving storyline. Motivated by our belief that a fully-realized interactive drama has not yet been built, we embarked on a five year effort to integrate believable characters, natural language conversation, and dynamic storyline, into a small but complete, playable, publicly-released experience. Façade is the result of this effort. Rather than focusing on the traditional gamer market, we are interested in interactive experiences that appeal to the adult, non-computer geek, movie-and-theater-going public. Intriguing to say the least, and there’s a whole literature on the question of AI-driven narratives, or when “ludology meets narratology” to use part of the title of a paper by Mateas and Stern on this issue and it seems to me that looking into the promise of AI for interactive story-telling is vital and fascinating research. But has it arrived, really, yet ? My favorites here: not saying anything or moving at all, something the game fails to recognize entirely; or stealing objects from your friends’ apartment, again and again; or trying to discuss interior decoration in an empty apartment, not sure what happened there. What this means is that there seems to be little room in Façade for sheer perversity, making me wonder how much human perversity AI can actually simulate (try romancing Trip’s girlfriend, as several users seem to have — unsurprisingly? — done, and all you get, apparently, is a total blank face). Interactive seamless drama this is not — at least, not more than your regular movie-fan relationship with his or her movies: think an audience repeating lines back to the screen at cult shows of cult movies. Are you real, or a mirage ? Full disclosure #2: as this 2007 news story makes clear, the Façade game is supposed to be more than a computer game. Its true objective is to develop into an Augmented Reality game in which the player will evolve as naturally as in a real living-room, once (s)he dons on Virtual Reality goggles. Not clear how that works out without goggles and with merely a cellphone, as the article mentions, but there’s no doubt that as an immersive experience it would work much better — not because the dramatic options would then be truly limitless as in real life (the false pursuit of realism in art, to have works of art seemingly as undecided as life), but because the whole fun would be in exploring this I am here/this world is fiction distance that Virtual Reality interactivity keeps on promising. 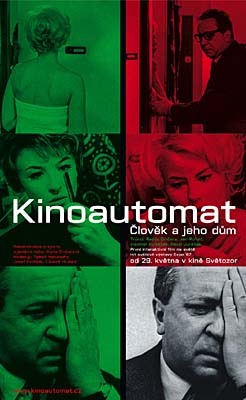 1/ It’s not the “first” interactive film: Kinoautomat (1967) has that distinction, a Czech experiment from Radúz Činčera that offered some choice to the movie audience in deciding where the plot should go (an experiment, as Alexis Blanchet explains, that was a satire of democracy as fake choices offered to the public, whose decision-making matters very little as the plot always manages to come back to the same points, regardless of voting). 2/ If interaction is about simple, binary choice (go up, go down, go left or go right, move on, help), as is the case with this trailer, then you can have it, thank you, and the study of interaction is not worth the paper its theory is printed on. 3/ It’s not about interaction really, as much as the illusion of intimacy: it’s the (illusion of) immersion, stupid! “I’m talking to the character !” — and the enjoyment of the distance that everyone of this words, in that sentence, requires to be said by a sane person. 5/ Recognized it yet? The operating referent here is not the interaction of video games, it’s the web cam — or the 19th century project that cinema partially fulfilled, and that network technologies have finally accomplished (until next technological iteration), the project of seeing a live image of someone and talking to that person at the same time. As Thomas Elsaesser has argued (“Louis Lumière – the Cinema’s First Virtualist ?” Cinema Futures: Cain, Abel or Cable ? Eds. Elsaesser Thomas, and Hoffmann Kay. Amsterdam: Amsterdan University Press, 1998. 45-61. ), cinema history should also be contextualized within the history of the telephone, as much as the history of images and screen — and the realistic illusion of cinema has just been one step towards the accomplishment of “virtual presence” that the webcam manages. 6/ If one then embarks on a search for “virtual presence” in media, retroactively, one finds it not just in benshi-like film commentators active in silent cinemas in the 1910s-1920s, but also in forking narratives and narrative over-presence in Hollywood silent films, and in the creation of a “virtual” reception space where audiences and fictions come to co-exist — that space that I call the realistic reception space of cinema, constructed, for instance, by ballyhoo like marketing techniques in 1920s America. Hollywood film audiences are sometimes immersed and sometimes distanced in 1920s exhibition film practices — and the key to understanding the variety of film reception contexts and practices, for Hollywood, is thus “illusion”: the virtuality of fiction is only possible through an active engagement of audiences through a playful mode of illusion — making-believe it’s real. 6/ And in that sense, Hollywood audiences have been interactive, and gamers, for a very long time. You are currently browsing the virtuality category at flycz.